I read the timelines and remember the events of that morning on purpose every September 11th. After I do that, I try to remember everything I ever knew about Sara Low. She was two years older than me. My stepbrother had a crush on her his freshman year of high school. She was beautiful. She was so, SO kind. She had striking eyes that were sharp and almond shaped. She smiled a lot. I'm pretty sure she was in the band because I remember her in the marching band uniform. I think she played the flute. I'm not sure . . . it was a long time ago. She ran track (so did my brother) and she was a cheerleader and she was an honor student. That's all I can remember because we were children the last time I saw her . . . but I feel like the least I can do for her is remember her. The reports online say that she was not originally scheduled to work on flight 11. After the hijacking began, she tried to call her parents, but she dialed the phone number they had when she was growing up instead of the current number. She didn't reach them that morning, but she gave one of the other flight attendants her calling card. The card was used to place five calls out with warnings before it was over. The report said Sara's father speculates that maybe because of the stress and fear . . . her childhood phone number was the only one she could remember. Every time I think about that, it makes my stomach knot. She was too good -- in every way too good -- to suffer that kind of fear. I hope she wasn't scared for a long time, and I hope someone was holding her hand. Every September 11th, those of us connected by some memory of Sara Low are bonded by brief memorials to her. Strangers searching the web for memories of Sara sometimes find my memorial and compose a message. My brother Tim usually stops here to remember the girl he knew. I expect to hear from "Toddler," who drops by every year on this date to think of Sara, and I in turn visit him, though we never knew each other personally and have only this connection. I've promised to buy him a beer or two if he ever happens to be in Seoul, and I'd like to do that for him since he grew up in Batesville and knew Sara, but I don't know if that'll ever happen. And I offer thanks to "Mrs. Nix" for her words, which I've borrowed without asking, and hope that she'll be understanding if she happens upon my blog entry for this 9/11 anniversary. I don't know what is more vivid in my memory: that day, or how enraged it made me. For me, the anger came later. I recall first being worried about the future that I was bringing my children into. My reaction was to learn more and disseminate what I learned. Sometimes I do struggle to understand Americans. Why do you pick to commemorate certain people over others? Why to mull over emotions like fear or distress that don't matter to her anymore, but strengthen neurosis in the living people? Whether she's in heaven or not, it doesn't really matter to her anymore. Why to bring up those painful memories? Masochism? But maybe there's something here I simply miss to understand. I don't know the answer to that, Jacek. We're probably at some basic cultural difference. I don't think it's masochism or neurosis, though. It's also not because Americans dwell on the past, either, for we've always been a forward-looking people. I too, believe Americans are typically forward thinking as a whole. However, Jacek makes a good point in that we, Americans, seem to be holding on, desperately at times, to recent tragedies. There is no way we can forget what happened, but when is the time to put it behind us and move forward? While 9/11 impacted the nation in a way most generations of us had never seen, it did happen eleven years ago, and we, as a nation, need to give it it's due in history and leave off with the constant reminders. This may sound cold to some, but I personally prefer to think of the possible better times ahead than continue to reflect on any horrifying events long in the past. I've been away from the States since the late 80s, so I might not be aware of what people are thinking. But speaking as a historian, eleven years is not long. Moreover, I think that we do need to remember what happened and why because this isn't over. Islamism is getting its second wind and will turn even more aggressive in the future, in my opinion. Exactly! Remember what happened and why....and work to prevent something as bad or worse from happening again. Totally agree. However, you are probably not innundated with 9/11 retrospectives by every major network and broadcast affiliate, each putting their own "spin" on that day. Most of them do not focus on the learnings or future prevention, but on the suffering of the ones who lost loved ones, or the continuing battles of the survivors. I understand eleven years is a short time historically, but it is the half a generation of mourning that needs to ask the question, when is enough, enough? I, as the vast majority of Americans, will never forget that day, and constantly pray for the well being of all directly impacted. As you say, let's keep it in mind for it's historical value, and use it to drive intelligence findings/research/condemnation/eradication of the fanatics, not to pile more suffering on those who have already suffered too much. I suppose I should give some thought to these annual posts and consider what I want to remember. My apologies if I seem to be coming on too strong here. Your blog is fine and remembering someone, no matter the connection, is a precious thing. My blatherings were driven by Jacek's post more than your blog entry. I wasn't offended. I was merely roused to consider what I intend. I'll have to think about it. Jay put it the way I would, if I were not limited by my imperfect English. My lovely grandma mentioned long German occupation in a very neutral way, without judging the occupants, even though they killed one of her, then 3y.o. sons. She used to say "let bygones be bygones." My father, in his very rare moments of sobriety related polish guerrilla's acts of sabotage against the Nazis in such way that we all listen with our mouth open - like a good war movie. No emotions involved. On the other hand my mom involved the whole world in her bouts with my father. As a result I'm a struggling ACOA but have no bad feelings towards the Germans whatsoever. I like what the father said to his son in Gibson's Apocalypto: "Don't bring fear into the village. It will crawl into the soul of those who engage it." I agree that fear needs to be overcome. The 9/11 fanatics wanted to throw terror into American hearts, so we can't let them have what they wanted. One need not be fearful when remembering the dead, and once a year for remembrance doesn't seem excessive. However, I've not been living in the States, so I don't know what's going on there. I've laid back awhile considering how I'd phrase my personal musings about this (particular) memorializing. Yes. It is true this tragedy was eleven years ago. And yet, yet... no matter the eleven years passed, we've (citizens of the US, Jacek) still got fellow citizens spilling blood in Afghanistan. Regardless of how one "feels" about the merits of our continuing military operations in that forsaken place - the events of 2001 are inextricably tied unto the events of some (hopefully) few months to come. And in being so bound - the wounds are yet to have had time to even be swabbed of the debris that comes with the original infliction. Much less have we had the necessary interval between the first to be killed and the last to be killed in our continuing nightmare. We have our Sarah Low but we have yet to recognize a Kelton Rena Turner. We've had no opportunity to even begin to gather together the names of all those who will at some future date, be handed over to the stonemasons who will then etch those names onto the slabs which will form a "The Wall." Thanks, Herschel. The agony does continue. [I would add (Jeff), I personally separate what ties 9/11 and Afghanistan to the mess known under the umbrella of Islamism. Yes, I recognize Wahhabism was the precursor symptom and though I too know it's hard to separate all the manifestations out - even Historians use placemarks to denominate periods. I therefore separate generally, 9/11-Afghanistan from the 2003 invasion of Iraq as "causing" Islamism. My reason for doing so is likely murky so I'll try to cast abit of light. Afghanistan was purely and (in the very beginning) clearly punitive in intent. The "given motivation" for invading Iraq was to rid the region of WMDs but most important was the (fool's errand) bestowing of democracy. Democracy is a messy business in even the more genial environments. Yes, we've wasted time, money, and blood trying to build democratic nations where they are not wanted. I appreciate your remembering Sara Low since September 11, 2001. I did not know Sara Low nor her family but being an Arkansas resident, her death very much impacted me. I was on the ground in Little Rock on an American Airlines plane when it was announced that all flights were grounded by the FAA not yet having heard of the events that were already in motion that day. 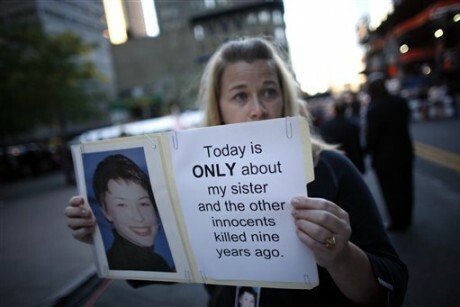 In the years since 9/11, in all that I've ready about the family of Sara Low, it seems they have just existed ..only living to see that those guilty of such heinous crimes were punished and that Sara is not forgotten in the annual ceremony to remember the perished in NYC. My hope and prayer for them is that the spirit of Sara Low .. the "Joie de vivre" in which Sara seemed to live her life will also find it's way into the hearts of Sara's parents and sister. Otherwise, not one life would have been taken but four lives. May they choose to LIVE.. really live this life to honor the memory of Sara. Thanks, Ms. Lunday, for putting it so well. I'm only just seeing Susan Lunday's patronizing post about my parents and me, and I am compelled to respond although it's several months past. My parents and I HAVE NOT just existed and DO NOT and NEVER WILL just exist to see that justice is served in Sara's memory, nor do we live just to attend the memorial in New York each September. We live good lives in honor of her AND because it's who we were before we lost her. We're doing quite well, thank you very much. Shame on Ms. Lunday for passing judgment on us based on what she sees in the media. She should realize that the only information she's going to read about us is attached to lawsuits and ceremonies because that's what grabs the media's attention. We are not consumed by our loss. We're stronger than that. I'd thank everybody on this thread to refrain from criticism unless they suffered a direct loss on that day. You cannot know of what you speak unless you have lived it. And I am so angry that I hit the wrong key. I'm posting again to verify that I, Alyson Low - the very alive and kicking sister of Sara Low - wrote the previous comment. Thanks for the reminder, Alyson, that you and your parents have continuing lives. I hope that others always understand that even when they might not express themselves well enough on the point. Well, I should have been more measured in my post, but I was blindsided by such an unfair, inaccurate characterization of my family by a complete stranger. I appreciate your remembrances of Sara each year, Jeffery, because they are understated rather than maudlin, and the dignity and thoughtfulness of them is appropriate to Sara's memory. I am sorry that there are people who believe the time is past for such reflections, because I think that is dangerous. When we forget the invaluable worth of the people lost that day, disorder returns to our priorities. I'm actually one of the family members who believes it's probably time to stop calling the names of the lost on each anniversary. I think a national moment of silence would be absolutely fine. That can hardly be considered staying mired down in the past. We must remember, even in the smallest of ways. And I would say that if I were not a 9/11 family member. I'm saying that, in fact, as a human being. Thank you, Alyson, for a thoughtful comment. I'm encouraged to continue my yearly posts. The 9/11 attacks really woke me up, though I was so shocked at first that I hardly knew what to say. I was shocked again about 2005 or 2006, when my brother Tim first told me of Sara, and 9/11 really struck home then, but I knew better how to respond. I think many people who mean well still don't fully know how to express themselves. Growing older helps . . . or has helped me, anyway. Message from a childhood friend . . . Slaughter on the Savannah . . .